We present the case of an 8-year-old child in Ethiopia with a large coronary artery fistula connecting the left anterior descending artery to the right ventricle, who was treated by a combined surgical and percutaneous approach. First described in 1865, coronary artery fistulae connect the coronary vessel to a chamber of the heart, the pulmonary artery, or the coronary sinus. Coronary artery fistulae are relatively rare, representing 0.2–0.4% of all congenital heart defects  and can be asymptomatic and close spontaneously, or they can manifest as myocardial ischemia, arrhythmia, or heart failure. In the case of large and/or symptomatic fistulae, surgical closure is indicated; however, in young patients, large uncorrected fistulae can be difficult to visualize. The majority of fistulae can be closed using percutaneous procedures; although, invasive surgery is sometimes required to achieve full closure. An 8-year-old child was admitted to a cardiology center with biventricular heart failure. 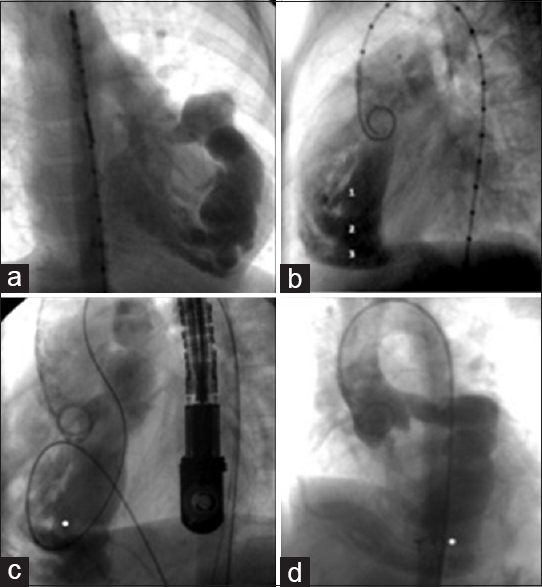 Echocardiography revealed a fistula from the left anterior descending coronary artery opening into the right ventricle through three outlets [Figure 1]. The right cardiac chambers were severely dilated. In November 2010, catheterization and coronary angiography were performed, revealing significant dilation of the left anterior descending artery and a large fistula from the middle third of the artery, with three large orifices emptying into the right ventricular chamber. Percutaneous closure is the current treatment of choice for coronary artery fistulae and the medical team elected to initially place a patent ductus arteriosus closure device (Amplatzer duct occluder, [ADO]) into the largest orifice. Using angiography, the team located the three fistulous orifices that emptied into the right ventricle through the middle and lower third of the interventricular septum; the largest orifice was 4–6 mm wide. 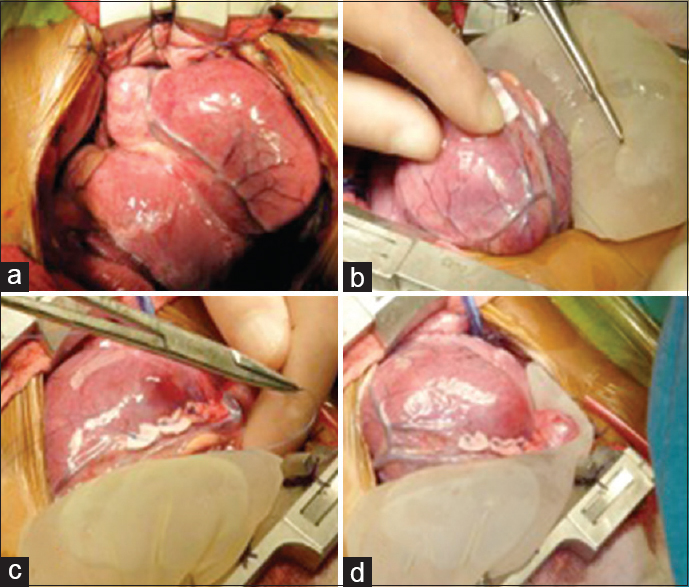 Following the creation of an arteriovenous loop, a size 10/8-mm ADO occlusion device was inserted transvenously using a 7F long sheath catheter; the placement and stability of the device were confirmed using transesophageal echocardiography [Figure 2]. After the placement of this first device, the child was discharged under medical treatment. Three years later, the patient's New York Heart Association (NYHA) cardiac functional Class was II–III. Following a risk-benefit analysis, the team elected to attempt surgical closure of the remaining orifices. The closure was performed without cardiopulmonary bypass and was guided by transesophageal echocardiography, with sutures placed below the left anterior descending artery to close the fistulous trajectories [Video 1]. The patient showed clear clinical improvement and was discharged 10 days after surgery. In a follow-up assessment 3 years after surgical closure, the patient's NYHA functional class improved to Class I, and echocardiography showed only a small residual fistula. In summary, we report the treatment of a coronary artery fistula in an 8-year-old child in Ethiopia using a two-step approach. In many patients, coronary artery fistulae can be treated using either a percutaneous or invasive surgical approach. In clinical settings in which the appropriate technology is not available, a combination of both treatments can be vital for achieving successful treatment. Krause W. Ueber den Ursprung einer accessorischen A. coronaria cordis aus der A. pulmonalis. Z Rat Med. 1865;24:225–9. Urrutia SC, Falaschi G, Ott DA, Cooley DA. Surgical management of 56 patients with congenital coronary artery fistulas. Ann Thorac Surg 1983;35:300-7.